WELCOME TO PRIME LIFE MINISTRIES: God Lives In You. Note: This often takes courage on our part. What Adam needed was already inside of him. 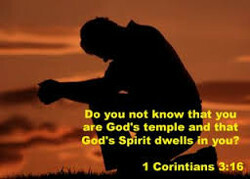 Note: If you are a born-again believer, God lives inside of you. We can tie God's hands by our thinking and our words. If God is peace, joy, healing, prosperity, then these are inside of you. Sadness and Depression are spirits. Don't empower these spirits by doubt and unbelief. As a believer, the Holy Spirit lives inside of you. All the power you will ever need already exists inside of you. This is the same power that raised Jesus from the dead. No matter the problem, Jesus is the answer. With God, All Things Are Possible. Nothing Is Too Difficult For Him.